The Nari headsets all look exactly the same regardless of price. There’s a metal headband with a padded suspension band below it. Earcups stay at a fixed vertical position, but swivel to lay flat against your chest when hanging from your neck or for fine tuning placement over your ears. Inch-thick cooling gel memory foam earcup pads keep comfy for extended periods of time, even if you wear glasses like me. On the backside of the left earcup you’ll find a mic mute button, game/chat mixer scroll wheel, power button, Micro USB charging port, 3.5mm headphone jack and retractable boom mic. On the right, it’s much less populated, with only the volume scroll wheel and spring-loaded holding slot for the 2.4GHz wireless USB dongle. 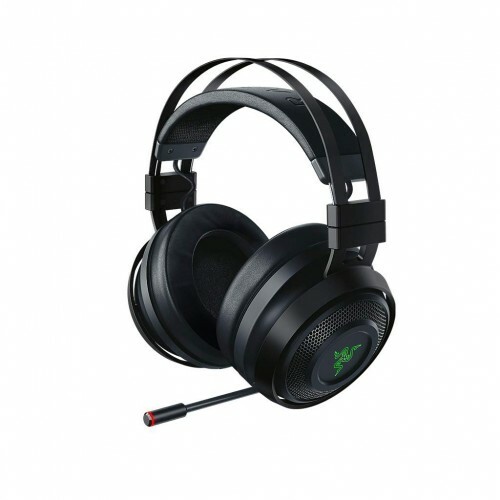 The industrial design is clean, minimal, and is monochrome until you power them on and the RBG Razer logo on the earcups lights up. As far as the haptics go, Razer uses big 50mm drivers. Essentially, the haptics replicate the way a subwoofer’s massive driver operates, by moving motors at the same frequencies that a subwoofer pushes air around.